The Sunday Times Newspaper recently held a competition for chocolate cakes. As I have not heard anything back from them I am going to assume I did not win. That does not matter, as this cake is a winner in my eyes. I have to find new and innovative ways to use up the left over fed sourdough I have each weekend. As I bake a cake most weekends I decided to kill two birds with one stone and bake a cake using sourdough starter. The idea for the cake came from my aunt Michelle, who lives in Germany. She told me that her version always rises, and so far, each time I have made this cake it has risen wonderfully. It does not stay fresh for long so I would suggest that if you are going to make this sourdough chocolate cherry cake that you bake it for an occasion, when you are expecting guests. I used frozen cherries as they are sugar free and what I had available at the time. Feel free to use preserved or even fresh cherries when they are in season. Do you enter baking competitions? Looks like a great alternative Christmas cake idea, worth a try I think? I will, I also blogged about it and linked the photo from this page to your blog as a credit acknowledgement!! I did your recipe this time, but am so going to try it again!! I am baking this right now, but wanted to know, if I used the starter and no baking powder.. and left to rise overnight.. would that work? I’ve never seen a sweet sourdough cake. How interesting! I was going to begin a starter today, so I’ll save this recipe for when I’ve got the hang of the basic sourdough and am ready to move onto something a bit more advanced…! That looks tummy-rumblingly moist, Tandy! I shall use this recipe for sure, but I have never used sour- dough before. How do I get hold of it or make it? Your sourdough cake looks very nice and moist. Chocolate and cherries are such a terrific match. Brandy and Cherries and chocolate? Sign me up. Your cake looks so moist and a great way to celebrate the end of the cherry season. Absolutely loving the combo of chocolate with cherries. Yum! 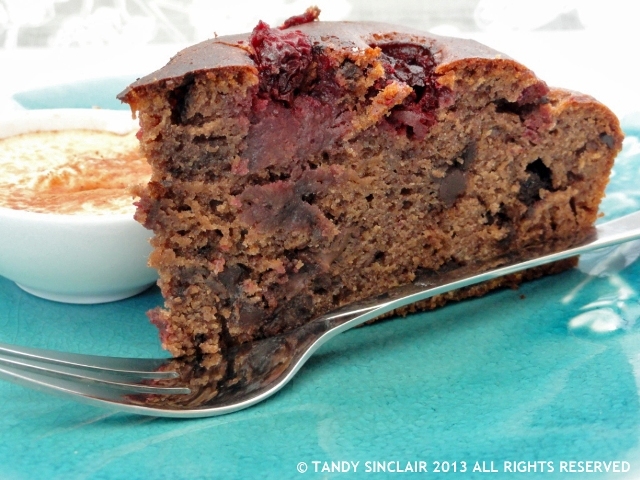 LOVE the combination of chocolate and cherry in this sourdough cake! Yum – it is most definitely a winner indeed! Love the sound of a sourdough cake, looks moist and bursting with flavour, yum! I too like baking competitions, I love the inspiration of creating something you may not have thought of otherwise and usually, if there are prizes, they are something very useful like a baking course or kitchen gadgets, what’s not to love about that?! This actually almost made me drool. Yum! I’ve never thought to pair these together but it looks and sounds incredible!!! I don’t bake. I never enter baking competitions but that cake looks moist and amazing. I know I’d like it. I never think to do anything with sourdough other than make bread! But this cake is genius! This does sound like a winner Tandy. Hope you hear from the paper soon. I love the flavour so much! And it looks so moist!